Food poisoning occurs when people eat or drink harmful microorganisms (bacteria, parasites, viruses), usually in contaminated food or drinking water. Food poisoning is especially important to avoid during pregnancy because the immune system is weakened, which can have serious consequences. Avoid all raw and undercooked seafood such as fresh tuna, king mackerel, red snapper, and tilefish. These types of fish have high levels of mercury. Salmon, cod, tilapia, and tuna fish are acceptable. However, limit your intake to 12 ounces per week. Your palm will measure about a 3-ounce portion size. Avoid raw eggs, which can be found in homemade mayonnaise, eggnog, Hollandaise sauce, mousse, and Caesar salad. Thoroughly wash raw fruits and vegetables before eating them. Avoid lunch meats, cold cuts, or smoked or pickled fish unless they are cooked until they are steaming hot. Avoid soft cheese made from unpasteurized milk: feta, brie, Camembert, “blue-veined cheeses,” queso blanco, queso fresco, or Panela. Cook meats thoroughly so there is no trace of pink or blood. Don’t eat leftover food more than two days old. Avoid drinking untreated water, especially when traveling in less developed countries. CLEAN. Wash hands thoroughly with water and soap before and after handling food. SEPARATE. Don’t cross-contaminate. Separate raw meat, poultry, and seafood from ready-to-eat foods. COOK. Cook food thoroughly by using a thermometer, the danger zone at which bacteria can grow is between 40 °F and 140 °F. CHILL. The thermometer in your refrigerator should read 40 °F (4°C) or below and the freezer 0° F (-18°C). Refrigerate food within 2 hours. Food poisoning during pregnancy can cause serious health problems, miscarriage, premature delivery, or even death of the mother. There are many bacteria that can cause food poisoning, such as E. coli 0157:H7, Methlymercury, Toxoplasma, Salmonella and Listeria. Symptoms of food poisoning vary. Vomiting, diarrhea, chills, upset stomach, fever, headache and body aches can develop. Eating a contaminated food will usually cause symptoms in one-to-three days, but can develop as early as 20 minutes after consumption, or as long as 6 weeks. Centers for Disease Control and Prevention. Be Food Safe: Protect Yourself from Food Poisoning. Department of Health and Human Services. Food Safety for Moms-to-Be. United States Department of Health and Human Services. 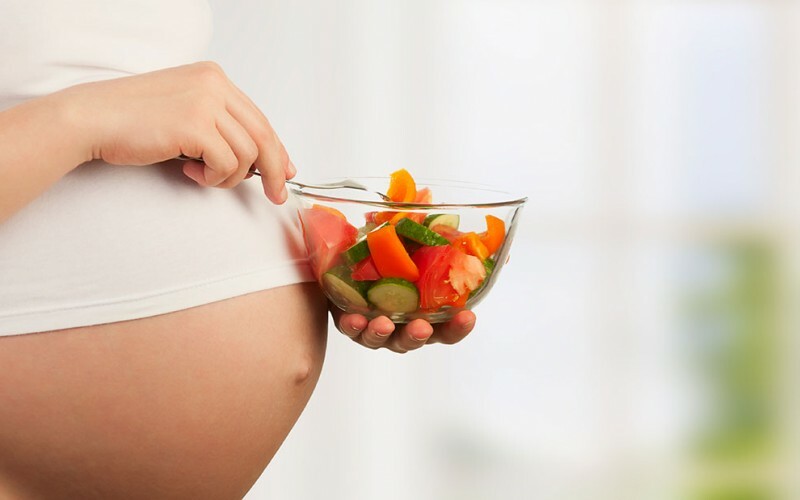 Food Safety for Pregnant Women.